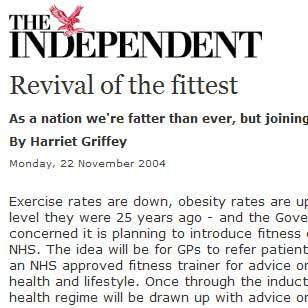 Exercise rates are down, obesity rates are up – five times the level they were 25 years ago – and the Government is so concerned it is planning to introduce fitness coaches on the NHS. The idea will be for GPs to refer patients for sessions with an NHS approved fitness trainer for advice on exercise, diet, health and lifestyle. Once through the induction, a personalised health regime will be drawn up with advice on daily exercise and dietary improvements. David Marshall’s Bodydoctor Fitness Programme takes six weeks and, if followed correctly, may help you lose a stone in weight, double your fitness and reduce your waist by five inches, through a series of specific exercise combined with an element of cardio-vascular training and dietary changes. No wonder it has attracted numerous celebrity followers from footballer Rio Ferdinand to supermodel Sophie Dahl. Where can you go for advice, and what do you need? Bodydoctor by David Marshall (HarperCollins) outlines the Programme with easy to follow photographs and nutritional advice. What is also great are anatomical drawings showing exactly what muscles are targeted by what exercises. Available for £14, inclusive of postage and packaging, from www.bodydoctor.com, as are videos and DVDs. DVDs for back pain, leg pain, and neck and arm pain contain specific exercises for problem areas. Produced by Judith Pitt-Brooke and available from www.homephysio.com. Although you can use tins of baked beans, these are a little more aesthetically pleasing and essential for the resistance work necessary to strengthen muscles. The Bodydoctor Training Programme requires work with weights, and every exercise that contracts a muscle is followed by one that stretches it, ensuring a balance. Handweights, from 0.5kg to 5kg, Reebok Neoprene. These shoes are beloved of Pilates teachers and osteopaths alike, as they ensure good posture while working the core muscles of the abdomen. Walking is an excellent cardio-vascular and weight-bearing exercise, and 10 minutes brisk walking or jogging in these is the equivalent of 30 minutes normally, because they force you to utilise thigh, buttock and stomach muscles in a way that ordinary trainers don’t. Also great for cellulite reduction.